﻿﻿﻿﻿﻿﻿﻿﻿Birdy legions flock to the Texas Gulf Coast for hummingbird celebration. ﻿﻿﻿﻿Imagine throwing a party for 4,000 people and the guests of honor fail to show. Well, that wasn’t exactly the case in Rockport and Fulton last September during the 25th annual HummerBird Celebration. However, the much-anticipated autumn visit of thousands of migrating hummingbirds to the twin coastal towns proved somewhat anticlimactic, thanks to a fickle Mother Nature who failed to RSVP, sending just a few hundred stragglers to the annual hummer hoedown. The silver anniversary of the “Granddaddy of Hummingbird Festivals” seemed an opportune time to spy the speedy nectar-drinkers that throng the hundreds of feeders strung from the iconic live oaks from Bayside to Aransas Pass. Did I see some hummingbirds? You bet I did, dozens of them feeding in suburban backyards of festival- featured Hummer Homes, an RV park and a state park (Goose Island). A beautiful sight to see, for sure, but instead of 60 or 600 hummingbirds swarming a cluster of feeders in one location (a typical outcome), I was lucky to spot six. But I learned plenty about the fascinating winged jewels and their migration from the U.S. to warmer climes in Mexico and points south, met some affable local hummer ambassadors and made some new discoveries. 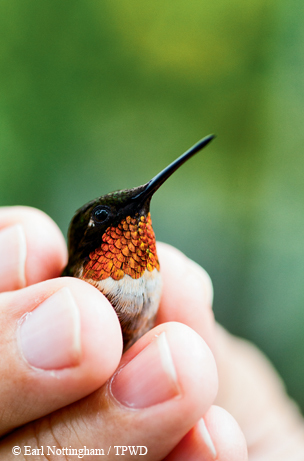 ﻿A biologist holds a ruby-throated hummingbird during a demonstration of how the birds are captured and banded. My trip’s timing seemed fortuitous since a recent rainy weather pattern that had soaked much of the Texas coast had given way to a clearing cool front that had pushed through Rockport-Fulton just before my arrival on a Friday afternoon. Good for me, but I would learn later, not so good for seeing squadrons of hummingbirds. I figured I’d need fuel for my “migration” to the festival epicenter on the campus of Rockport’s middle and high school, so I grabbed a late but tasty sandwich at Crazy Rusty’s Tropical Grill in downtown Rockport. A short drive took me to the alluring bay front. Here, tourist-savvy civic leaders have clustered a handful of attractions near the Rockport Harbor and Beach, including the Texas Mari­time Museum, the Rockport Aquarium and the Rockport Center for the Arts. With limited time, I ducked into the powder-blue, Victorian-era home housing the art center. With its high ceilings and abundance of natural light, the spacious gallery compares favorably with Texas’ finest big-city galleries. Docent Nancy Allen animatedly shared details about the just-opened “Birds in Art” traveling exhibit. The art center was one of only four U.S. museums hosting the prestigious avian art show sponsored by the Woodson Art Museum in Wausau, Wis. She proudly pointed out several works by local artists, such as Kent Ullberg and Al Barnes, who were accepted into the juried show. I still had time to check out the nearby Bay Education Center, but I was stopped dead in my tracks by a giant fiberglass blue crab looming over Little Bay in Veterans Memorial Park. Artist David Allgood’s re-creation of Rockport’s original landmark crab — which once sat atop the Del Mar Grill and later fell into disrepair and was buried — has brought back the community’s beloved icon. The Bay Education Center offers a fascinating study of the Mission and Aransas rivers estuary, one of 28 recognized national estuaries in the country. Opened in 2010, the center operates under the auspices of the University of Texas Marine Science Institute’s Mission-Aransas National Estuarine Research Reserve. The bay-side building houses an interactive exhibit hall and auditorium for guest lectures and the truly mind-blowing, hourlong “Science on a Sphere” presentations. The National Oceanic and Atmospheric Administration-sponsored sphere program in Rockport represents one of only 60 in the nation and one of three in Texas. The awe-inspiring global display system uses computers and four video projectors to display planetary data on a 50-pound, 6-foot-diameter globe that appears to slowly spin. It is a must-see experience. To kick off Saturday’s activities, I signed up for one of the many HummerBird Celebration tours — a two-hour, guided boat birding trip on the Skimmer, a double-decked, shallow-drafting vessel piloted by Capt. Tommy Moore. “Captain Tommy,” who left his corporate job in Houston to pursue a Jimmy Buffett-inspired lifestyle, has been conducting bay tours out of Fulton Harbor for 10 years. The affable captain regaled his passengers with coastal history and lore, and demonstrated his considerable birding prowess by calling attention to dozens of avian species as we cruised to the barrier islands separating Aransas Bay from the Gulf of Mexico. 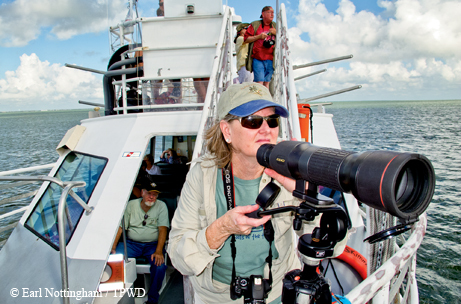 ﻿﻿Aboard the Skimmer, birders scope the barrier islands of Aransas Bay. Though we were too early in the season to see the area’s famed whooping cranes, we were treated to sightings of a variety of common shorebirds, such as the American oystercatcher, long-billed curlew and black-bellied plover, as well as a who’s who of gulls, terns, herons and cranes and the colorful roseate spoonbill. A wood stork searching the shallows for a meal and a gawky-looking magnificent frigatebird gliding overhead stole the avian show. I set aside the rest of the day for the hummingbird festival. In 1988, local birders Jesse Grantham and Betty Baker conceived the idea for a festival to honor the mighty mites that buzz area feeders each fall. Seed money from the Rockport-Fulton Chamber of Commerce helped get the ball rolling. A few hundred curious birders showed up for the inaugural celebration. Today, the four-day fest attracts thousands of visitors from throughout the U.S. and abroad. I arrived to a buzz of activity. Regis­trants were streaming through the band hall, where featured speakers held court, and Hummer Malls I and II. I browsed among the more than 50 vendor booths selling wildlife-inspired jewelry, clothing, arts and crafts, and, of course, hummingbird items in every shape and style imaginable. Between the two malls in an oak motte, I enjoyed a close-up view of live owls, an Aplomado falcon, a kestrel and other raptors on display, courtesy of Sky King Falconry. Nearby, several children cavorted in a butterfly tent and peeked into the Texas A&M-Corpus Christi “Wetlands on Wheels” exhibit. It was time to go see some hummingbirds. After a brief consultation with local festival representatives about which of the 24 featured homes/sites were seeing the most hummingbird action, I was off. My first stop was the Coward Home in the Rockport Country Club neighborhood, a featured Hummer Home Tour site for 18 years. In their tropical paradise of a backyard, the Cowards set out lawn chairs surrounding a hummingbird station with multiple feeders. Additional feeders adorned blossoming fruit trees and palms. Several visiting ruby-throats entertained visitors by dive-bombing each other and a larger buff-belly competing for a sip of sugar-water. Visitors simply park out front and walk around to the backyard. Festival participants can take their own self-guided tour of the homes or sign up for a guided tour. 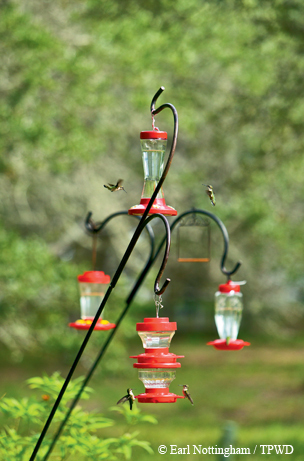 ﻿﻿﻿Feeders attract hummingbirds at the Bayview RV Resort. Acting on an earlier tip, I stopped at the Bayview RV Resort, Site 219, whose residents had hung 15 feeders just beyond a thicket of banana trees in view of an observation bench and lawn chairs. A sign at the site’s entrance advised: “Quiet. You get hummers.” Sure enough, I spied a couple with binoculars ogling more than a half-dozen hummingbirds buzzing about — the best showing thus far. The next morning I tried to see hummingbird banding at the Reisingers, arriving too late for that but just in time to hear retired Texas Parks and Wildlife Department wildlife biologist Kelly Bryan explain the event’s scarcity of hummingbirds. He blamed the low number of sightings on the tropical storm spinning just off of the eastern coast of Mexico, saying the storm was creating northerly winds over Texas. 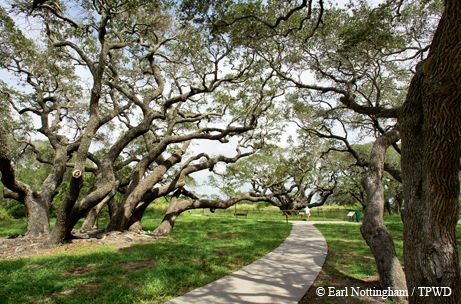 No trip to this part of the coast seems complete without a visit to Lamar Peninsula’s mammoth, 1,000-year-old live oak, known as The Big Tree, and nearby Goose Island State Park. The state park was stop No. 24 on the Hummer Home Tour. Each year during the four-day festival, the state park waives its usual entrance fee. ﻿﻿﻿A trip to the area isn't complete without a visit to Goose Island State Park’s Big Tree. Park ranger Wanda Wright acknowledged it was a slow year for hummingbirds at the park, which puts out 15 feeders during the fall migration season. We visited one feeding station in the wooded Lantana Camping Loop, which was getting some attention from a handful of ruby-throats and a buff-belly. She lamented that it was only the second time in 15 years that the stars of the festival failed to appear in their usual great numbers. “They’re waiting for the barometric pressure to ease up after the hurricane blows itself out before heading down to the coast,” she said. Though my hummingbird encounter was a little less than I’d hoped, there will always be next year, when the timing may be better to “dance” with the tiny winged darlings of the avian world.